Right on the heels of our last post (kind of) condemning the modern beer fest we have one that seems to be worth it. This one comes in at $39 for general admission and 3 hours of tasting. For a $20 upgrade you can get that extra hour bumping it to 4. The lineup isn’t as strong as some others when it comes to rare finds or exotic beers but it does include a good amount of ciders as well as 12 wineries (12!!!) Plus, a beer fest is a beer fest nonetheless, right? Reminds me of the good old days (you can’t see it but I’m reminiscing in my rocking chair, the opposite of shaking my fist.) Add in the wineries and ciders and it makes it easier to find a fest companion who may not be as into beer as you or is just looking for a basic intro into the world of craft beer. Finally, location wise, it is right off almost every major subway line around Atlantic Terminal in Brooklyn. What’s not to like? Come join TapHappyAdventures (we’ll be there at the Saturday night VIP session) for some beers and good times! Want to get in the game? Go check out the beer list at the link above and tell us which ones you’re excited to try. Hit us up on Twitter or Instagram and show us your tastes. We can’t wait to get our tasting glasses filled with Saranac Rudy’s Spiced Christmas Ale and Schlafly Oatmeal Stout. What about you? Brewfests. They continue to grow in popularity making them bigger and better. With the pros, however, come the cons. For with the ever expanding beer lists and brewery participants come the expanding crowds, longer waits in line, and, the big one, the enormous jump in price. If you’ll put on your old curmudgeonly hat right now you can join us in shaking our fist and yelling how we remember the good old days! Fast forward to the current day and you’ve got festivals like NYC Craft Beer Festival** which usually holds 4 events per year, one for each season. The last one we attended, Summer Jazz, which took place at Webster Hall in NYC, was, as you can see in the attached picture, , was $65 for early bird, $75 for Advance, and $85 at the door for the VIP. What it doesn’t show is that the VIP is now only 3 and a half hours and the regular entry only 2 and a half, a far cry from the old days. Commence fist shaking. Once they let us in a good number of the breweries weren’t ready to pour yet and some people weren’t even set up at all. Halfway through the VIP hour the lines started to get long, waits increased for beer and the bathroom, and it became harder to move around in general. We left after about 2 hours because of the massive crowd clogging up every path. To us, it had finally jumped the shark and just wasn’t worth it anymore. Now we can remove our old curmudgeonly hats and put on our innovative creative hats. Seeing the hassle that now comes with these brewfests we decided to have our own fest, or beerfriendst if you will, at one of our houses. Everyone was to bring a couple six packs of something they have never had or that looked interesting or a package of mixed singles if they were lucky enough to live near a place that sold them. Beer was refrigerated and great times were had by all. This way we could not only avoid lines and high prices but also control our own speed of drinking and level of drunkenness while also being able to better enjoy the company of friends. No rushing from booth to booth to try and beat a line or chugging down a beer because you wanted to get the next one before it kicked. While this isn’t an original idea nor the first time anyone has done this we felt accomplished and satisfied. We ended up sampling 21 different beers amongst our small group, a resounding success. We look forward to the next one! For a complete list of the beers that we sampled you can click here or check us out on Tumblr or Instagram. You can also stay up to date on TapHappy goings on on Twitter and Untappd. Welcome, everyone, to the beginning of something. I’d like to sit here and tell you it will be something special, or momentous, or any other amount of adjectives and descriptors, however, I can only be honest. Here at TapHappyAdventures the goal is just to explore the world of beer for everyone, from the beginner who just discovered something other than Bud Light to the aficionados and foamheads who know it all. Hopefully this will be something you’ll enjoy and follow. Join us on our quest. For now, we will try to keep the blog updated as often as possible but that takes time, effort, and could cost hundreds of lives. 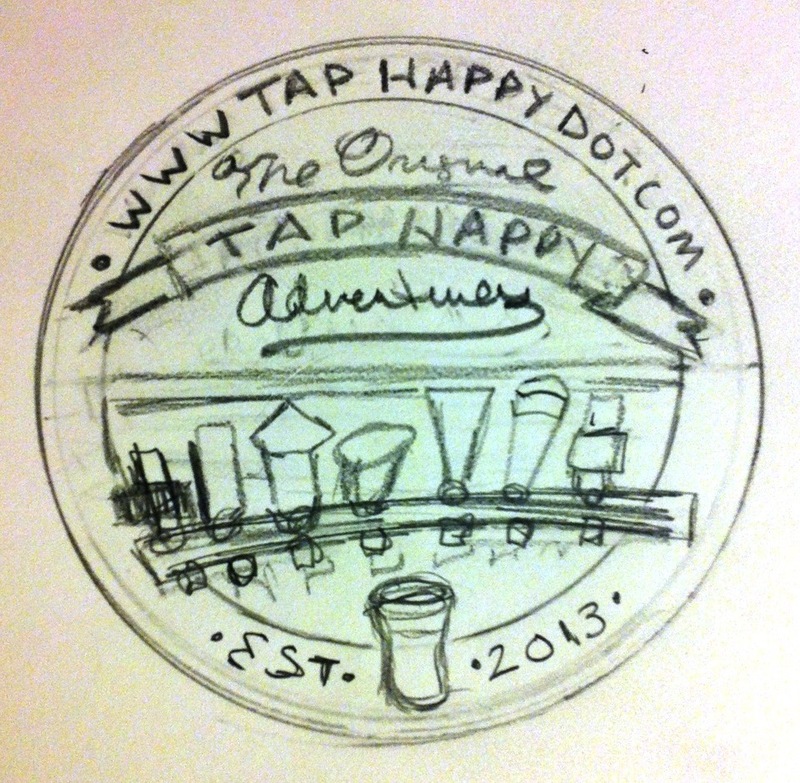 In the meantime you can check us out on Twitter and Instagram (@TapHappyAdv), follow us on Tumblr (TapHappyAdventures.tumblr.com), or leave now and miss out on the opportunity to get in on the ground floor and be able to say you were there from the beginning. Whatever you may choose, we present to you, TapHappyAdventures! !